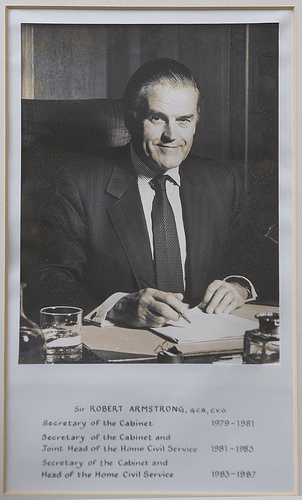 Lord Armstrong was Cabinet Secretary between 1979 and 1987, working throughout Margaret Thatcher’s premiership. In this interview with historian Lord Hennessy, he talks about his service under Margaret Thatcher. The Rt Hon Lord Armstrong of Ilminster, GCB, CVO entered the Civil Service in 1964. After a three-year period in the Cabinet Office, he joined the Treasury in 1967, becoming Under Secretary the following year. In 1970 he was appointed Principal Private Secretary to the Prime Minister, Edward Heath. He then moved to the Home Office, becoming Permanent Under Secretary in 1977. He was appointed Cabinet Secretary in 1979 and served throughout Margaret Thatcher’s premiership until 1987. View the photos of other former Cabinet Secretaries in our Flickr gallery.